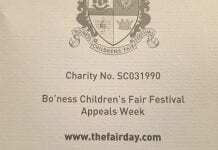 Bo’ness Children’s Fair Festival is an occasion for lifting up one’s heart in joyful celebration. It is an event, too, which fires the imagination as the glittering pageantry unfolds, transporting the children, who are the very essence of the festivities, into that Land of Make-Believe where dreams come true. It is well, however, to remember that in the beginning the Fair had its origins in the emancipation of the miners who were thirled to the pits to such an extent that, along with the mines, they and their children could be sold like slaves by the coal-owners. The task of making this striking piece of headgear was entrusted to the wife of one of the miners, no doubt selected because of her skill with the needle and her artistic abilities. The basis of the bonnet was a military-style bearskin, but this was adorned with tinted feathers, gaily-coloured beads and brightened by glinting fragments of mirror glass. The last lady to have fashioned a ” feather bonnet ” for the old-time miners’ celebration lived in the old Newtown Rows, and was still alive when these dwellings were demolished. Actually the celebration developed into two separate groupings – the Bo’ness miners and the colliers of Grangepans and Carriden. Unfortunately, but not surprising considering the times, the consumption of alcohol played a major part in the festivities, although it is recorded that when the marchers called on Mr Cadell at the Old Grange they were regaled on nothing stronger than lime juice. Interest in this celebration of the historic emancipation of the miners began to flag with the passage of the years, but the Fair was to be given a new lease of life and to take on the form which distinguishes it today. In 1897 Queen Victoria celebrated her Diamond Jubilee, and there were rejoicings throughout the country. Provost Stewart of Bo’ness, had been present at Lanark’s Lanimer’s Day, where the central theme was the crowning of a children’s Queen selected by her fellow pupils. He had the happy idea of borrowing from Lanark and the Bo’ness Fair as we know it today was launched on its triumphant course. It can now be said that the Bo’ness Children’s Fair Festival has enshrined itself in the hearts of the people of the town and has provided nostalgic memories of days of enchantment of Bo’ness exiles overseas. Another impression I retain of the Fairs I attended was that the assembled children really did display, as the Fair song has it, ” a field of living flowers, ” for all the boys wore caps in their particular school colours, forming in their massed ranks a living mosaic of red and blue, green and gold. I suppose it is too much to hope that today’s schoolboys could be persuaded to captivate us again by wearing such colourful caps! I also remember that many of the young folk who took part in the old Fairs wore ” gutties ” ( what we would now call gym shoes ), and they took a great delight in bursting the tar bubbles on the road as they marched in procession. Did the sun always shine on the Fair days of long ago? More mischievous boys – myself included – used to take a delight in treading on the heels of the boy in front so that he was ” un-heeled, ” so to speak, and was then compelled to drop out of procession to re-adjust his shoes, and, hounded on by the attendant teacher, had to run to take up once more his appointed place in the procession. On Fair days there was no ” creeping like snails unwillingly to school. 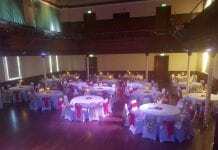 ” On such days we were up betimes and assembled in the school playground well in advance of the hour we marched off to join in the grand procession to the Glebe Park for the crowning ceremony. We all, apart from certain of the principal participants, actually walked from the school to the Glebe Park, in procession around the town, and on to the chosen place for the Royal Revels – to the Ladywell Park at Kinneil or to Kinnigars Park at Carriden. Not so many children walk in the Fair procession nowadays, and I sometimes think it is a pity, and wonder if the children of some sixty years ago – even the five-year-old infant pupils – were tougher or whether in these days of easily available transport today’s kids are beginning to lose the use of their legs. I have another abiding memory of a Bo’ness Fair. 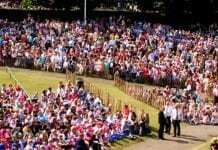 I was standing in the crowd at the Glebe Park watching the courtiers proceed on their way to the crowning dais. Next to me was a lady whose eyes lit up with pride and joy as she pointed out one dainty little fairy. ” That’s my wee lamb, ” she confided, and I noticed that she could not keep her eyes off her little girl. The pageant and the story are splendid to behold. The Courtiers in their glory go by in cloth of gold. A Champion ‘gainst foemen ready to defend his Queen. Behold the pageant moving – the staging of the Fair. She sees one only actor – her own wee Fairy girl. For her no haunting story – she only looks at her. She is the whole procession – her own wee Fairy Girl. 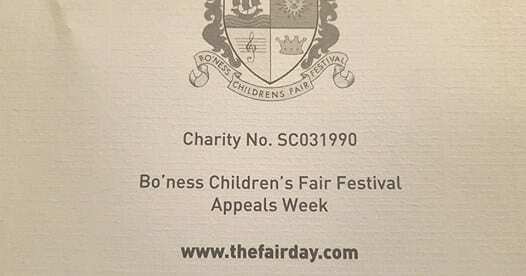 Over the years and the celebration of many Fairs I have come to the conclusion that the continuing success of the Bo’ness Children’s Fair Festival is due not only to the superb organisation, but principally to the fact that Bo’ness has always been a closely-knit community. Long ago the natives of the town acquired the nickname of ” Hamebiders. ” a surprising description because Bo’ness was a leading Scottish port, and many men of the town engaged in seafaring. Was it not Daniel Defoe who praised the Bo’ness sailors as being the best pilots for the Baltic and the Low Countries? Still, it is said that in by-gone days there was a certain distrust of incomers to the town. 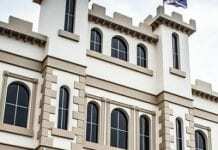 The story is told of one Bo’ness worthy who was notorious for his dislike of what he called foreigners, those who were not born Bo’nessians. One day he was in formed that a stranger had arrived in the town. He was incensed and demanded to be taken to the stranger at once so that he could drive him out of town. Nowadays we are more tolerant. In recent years Bo’ness has welcomed many incomers, and these newly-arrived folk have not been slow to identify themselves with the burgh, its traditions and its aspirations. They have become part of the community, and in no way is this more emphasised than in their support of our annual festival. The truth seems to be that there is something universally and perennially appealing about a celebration principally devoted to the enjoyment of children. It is something that stirs the heart and releases the emotions, for who can fail to be moved by the simple but proud and spectacular pageantry that marks the coronation of our elected Queen. Everyone with memories of former Fairs cannot but be convinced that the school-children have always chosen well. There has never been a Fair Queen who has not charmed everyone with her grace and dignity, never a Queen who has not carried out her regal duties with admirable dedication and with a high consciousness of the signal honour that has been conferred on her. So it will be with this year’s Queen, and all her loyal subjects will acclaim her with great gladness as she assumes the throne. May her day of royal splendour be one of happiness. May her family, her schoolmates, her friends and the many thousands she does not know also share in the pleasure that such a day of pomp and pageantry can bring, as all take part in a living fairy-tale that transports the young and the young in heart into that Never-Never Land of wonder and delight we know as the Bo’ness Children’s Fair Festival.